An Economical Solution Designed for High-Quality Transmission of SD, HD and 3G &12G SDI Signals on Single Mode Fiber. The SilverBULLET is an economical solution designed for transmission of SD, HD and 3G & 12G SDI signals on single mode fiber. Perfect for today’s professional and broadcast applications. At just three inches in length, this cost–effective solution is ideal for a wide variety of pro A/V and broadcast applications, including video production and editing, ENG with additional uses for sports teleproduction, field production, remote camera links, cross oh–campus production, pre–fibered venues and courtesy feeds. 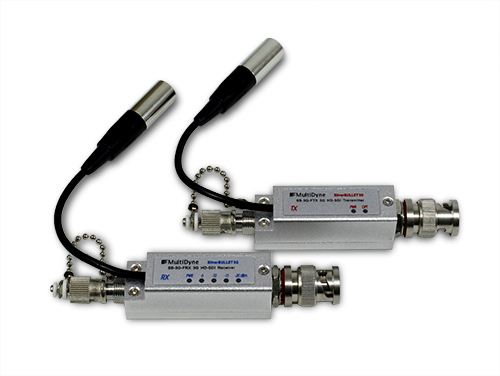 The SilverBULLET is designed for simple, single hop, 3G & 12G HD SDI fiber optic runs with a clean signal at the start. The SilverBULLET now ships in a compact pelican style carrying case. 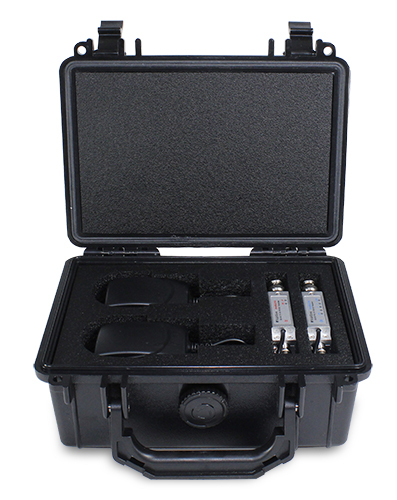 The carrying case holds one transmitter, one receiver, and two power supplies. When designing a 1.5G or 12G HD SDI fiber optic system, proper management of signal integrity and jitter is critical. If the noise or jitter characteristics of your HD SDI signal are not carefully managed and reduced with re–clocking circuitry, it is possible that your HD SDI signal becomes so noisy and full of jitter that the signal degrades beyond repair and recovery. For better Jitter Management and Reclocking it is recommended that a fiber optic transport system be used with HD SDI re–clocking such as the HD–1500 1.5G HD SDI fiber optic link or the HD–3000 3G HD SDI fiber optic link. MultiDyne also offers a new SilverBULLET Power Clip that provides the SilverBULLET with power via the DC power output on a camera. As other camera mounted fiber transport systems add additional weight to the camera, they can throw off the center of gravity for a cameraman, making it difficult to operate a camera that is off balance. The SilverBULLET Power Clip, when combined with the SilverBULLET, provides a small and lightweight 3G or 12G HD–SDI fiber transport solution powered by the camera.